I'll not get tired of saying it: Art making is truly a practice. And like any practice, our work develops over time and energy. One of the gorgeous things about art making is that building our awareness, building the ability to consciously see around us, is a big part of that time. The intaking of sights, sounds, scents, experience and emotion all count towards your art! Truly! And when we spend time in our sketchbooks recording and exploring that, we cultivate rich sources of new material from which to work with. Which leads us to the next phase: So you've spent the last five weeks building up collections of lists, ideas, sketches, doodles, color play, and writings... and now you're on to bridging the gap between your sketchbook into your various mediums. We've talked quite a bit on asking questions (does this need to be realistic, what does this remind me of, how can I imitate my marks and lines in pencil to textures in metal, leather, fabric, paper, brush, etc), and talked much on exploring thoughts and images through exploration pages, free associations and field notes. This is a huge part of the way I work, consciously searching, looking, wondering, writing, but today I want to bring us to balance, one final big check in with our intuition. Conscious thought answers so many of our questions, but every now and then, it's easy to become bogged down in the swirl of ideas and notions. To get stuck in our own heads - I feel it as a near physical sensation wherein all my thoughts (and there are a LOT) are tumbling inside the constrains of my skull, so much happening in a mere 10 inch diameter oval, that I can hardly decide which way to turn. When this happens, I turn to a few simple practices to clear the confusion and return to a balance of flowing thoughts. Sometimes it's tough to step back when we only have a certain amount of time to work in our studio, or when we set certain goals and accomplishments that we want to see achieved. But when I find myself in this place of the swirling mind, no matter the time constraints, I know I need to step back for a few moments and bring myself back into the present time and place. 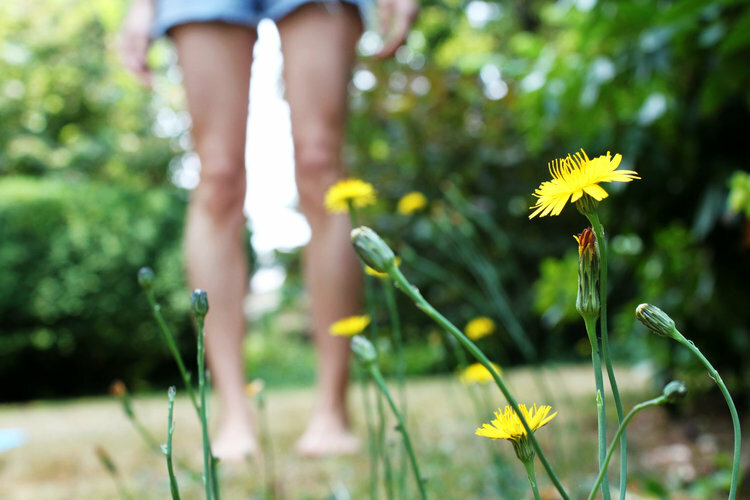 If it's possible, walk outside, take off your shoes and stand with your bare feet on the earth (and if not, your bare feet on your living room floor will do just fine). Take a three long, deep, slow breaths, thinking about filling your whole belly with that pure air. Notice your feet, and think about not just standing on top of the earth, but standing in the earth, a vital, breathing, beating part of all the life around you. You are important, and you are here. Continue breathing and feeling the whole world connected to your feet as long as it feels good. The very act of grounding helps bring us back into present time, to feel a connection with our here and now, and for me, to allow the unnecessary chafing thoughts to fall away and for clarity to shine through. Ladies, I'm here to tell you that you need to dance. Or at the very least, wave your arms in the air like a wild woman. I imagine that most of us have been in the place of working so focused on figuring out our thoughts, so concentrated on the image at hand, that we become tight. That gripping sensation wherein you're just trying so hard to get it all down, to accomplish "x", to make it just right if it's the last thing you do on this earth. I get it - oh yes, I know that place too well. I also know that for me, it's one of the first steps down the path of frustration, especially if it's during a limited amount of studio time. And it is absolutely one of those times to shake. it. up. Put on some beats and dance through one whole song, belt out the lyrics, stomp your feet, wave your arms. Even if it feels ridiculous, even if you need to move ever so gently, move your body! A few beautiful things happen: When we become tight in the hand and mind, our bodies instinctually want to pull closed, protect our soft underbelly; our muscles tense and prepare to protect and defend us from [even emotional] threat. We start holding that emotion of frustration in our physical being. But when we spread our arms wide, when we extend our torso, we allow those muscles to stretch and open, to relax and release some of that tension we were physically holding. We tell our bodies, in the most primal and non-verbal way, "hey, it's safe to open, it's safe to move" and in turn, that message gets delivered to our brains. Feel good endorphins are released, our circulatory system pumps, and some of that chafe from earlier falls off. It's a beautiful thing! And as a grand added bonus, you've raised some energy of movement and motion all around you, which always brings a dose of life to our artwork. One of my last practices to clear the swirl when it begins to overpower me, is to speak out loud to my muse. Now I'm aware that this may feel borderline odd for some, but there is so much power to words! When I'm overwhelmed, when I can't sort through ideas for the sheer number of them, when I'm caught up in a cyclical spin of same thoughts, I'll often say out loud "This is too much, too many, too confusing; I'd appreciate it if you could be more clear." Or those moments when I'm just about to fall asleep, or driving down the highway and a tumble of brilliance shines down, "If you want me to create this, can you please come back when I can write it down?" Just the very act of speaking those words out loud puts us in a place of intention and I always feel those intentions come back to us tenfold. With that, I want to leave you today with a simple to-do: Be kind with yourself. Be gentle and be proud, because the work of your hands is vital and good.